South Korea's parliament has voted to impeach President Park Geun-hye over a corruption scandal. The motion passed by 234 votes to 56, meaning some members of Ms Park's ruling Saenuri party voted in favour. Hwang Kyo-ahn, the country's prime minister, has become interim president. Thousands of people took to the streets in recent weeks demanding Ms Park's removal. After the vote, she again apologised that she had "created this national chaos with my carelessness". Who is President Park Geun-hye? 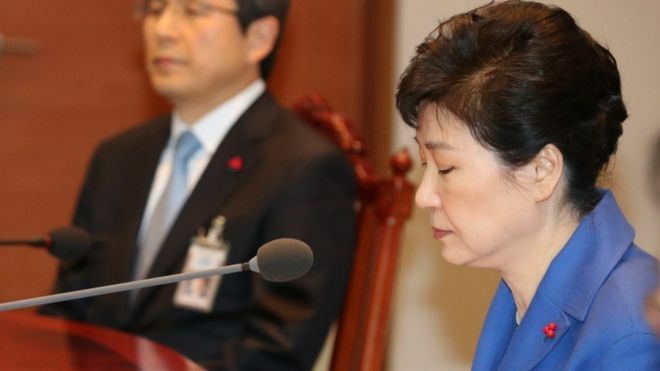 At the heart of the crisis is the relationship between Ms Park and a close confidante, Choi Soon-sil, who stands accused of using her connections to gain influence and financial benefits. She is in custody, facing charges of coercion and abuse of power. What did Ms Park do? Ms Park and Ms Choi have been close friends since the 1970s, when Ms Park was acting as first lady after her mother was killed during an assassination attempt on her father, then the country's military strongman. Ms Choi's father was a cult leader who had become Ms Park's mentor. It is alleged that after Ms Park became president in 2013, Ms Choi, 60, used their friendship to pressure powerful corporations into donating to two foundations she controlled and then siphoned off funds for her personal use. On Tuesday the corporations' leaders were grilled by MPs on whether they made the donations in exchange for political favours. Ms Park has also come under fire for allowing Ms Choi inappropriate access to government decisions, something which she has repeatedly apologised for. The parliamentary vote means Ms Park - South Korea's first female president - has been suspended. The case now goes before the Constitutional Court, which has 180 days to make a final ruling. If at least six of the court's nine judges approve the decision, Ms Park will become the first sitting South Korean president to be deposed in the country's democratic era and a new presidential election will be held within 60 days. In 2004, parliament impeached President Roh Moo-hyun, who was suspended for two months. However the court overturned the impeachment vote and Mr Roh was reinstated.